As the name itself indicates that this software is used to enhance Right Click option in our pc. Right click option is one of the most used part of the compute but sometime you may feel that your favorite option may not be available in right option. It is possible to add some options through some tweaks in Regedit but most of them don’t like to edit registry entry, in that case you can try Right Click Enhancer software. 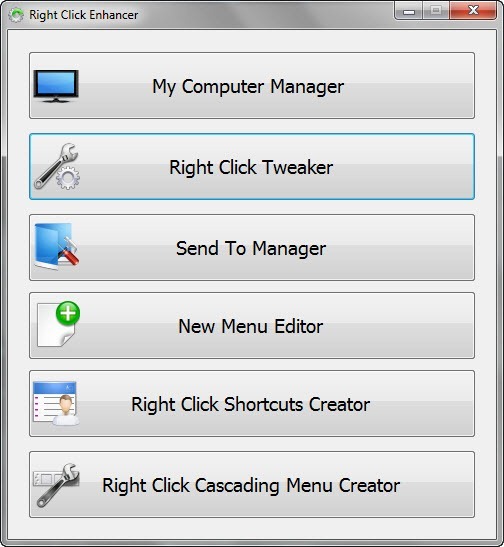 When you run Right Click Enhancer software you will see the menu like the above image. It has 6 options in it to edit Right Click Options. Here the below are some description about those options. (1) Copy To Folder & Move To Folder :- When you choose one of the options from the menu, you browse to any place on your hard disk to copy or move the file to that folder. You doesn ´t have to navigate to the place where you want to paste your file. (3) Encrypt & Decrypt :- Allows you to encrypt and decrypt your files and folders. Files encrypted can ´t be operable by another user on the PC. (7) God Mode & System Configuration Utility (Vista or 7) :- Add the options to open System Configuration Utility(msconfig) and famous god mod from user ´s right click menu. Allow users to add and delete items from there right click new menu. 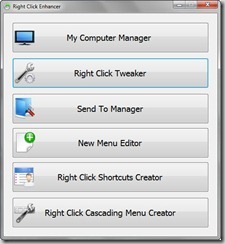 Right Click Cascading Menu Shortcuts Creator automatically adds a option to right click menu to add the files and folders to cascading menu by just right clicking any files or folder. User can also add files and folder from within the application by selecting cascading menu and clicking the add buttons. User can remove the cascading menu or files or folder associated with cascading menu. There are lots of options available in this Right Click Enhancer software, if you feel you don’t get something about this software then go for the help option which is available in that software. They have clearly mentioned how to use these options which is available in the software. You can also watch this video to know how to use this software.